I’m not sure what’s more exciting—celebrating your very first birthday with a beautiful and fun cake smash or getting to celebrate during the Christmas season. Lucky for baby V, she didn’t have to choose! Baby V came to the studio for her first birthday cake smash and goodness, we had a great time! This was my first time photographing Baby V, whose family came up from Rock Hill, SC to my studio. While I’m based in Charlotte, I do enjoy photographing babies, children and families from my surrounding local areas. Baby V’s parents wanted fun, cute photos to capture her personality and provide as Christmas gifts, and I think we achieved just that! I enjoyed creating her Wintery Woodland, Christmas-inspired birthday set and absolutely adored each outfit she wore during her session! 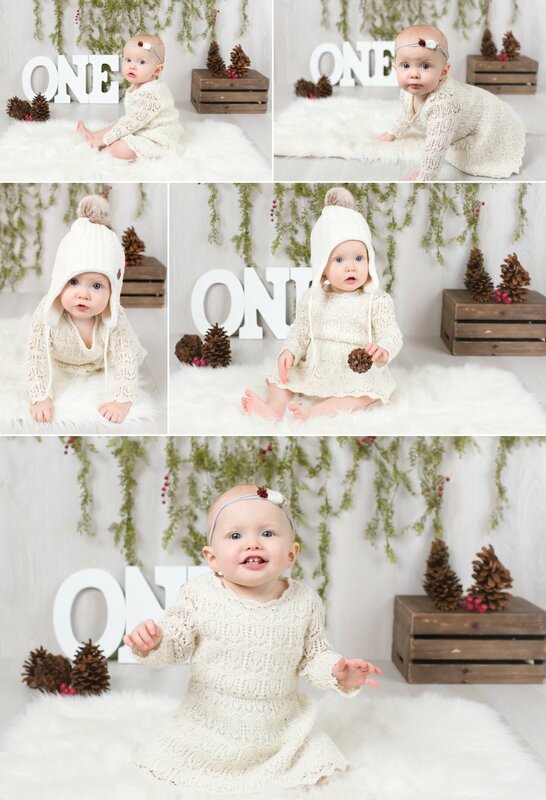 I absolutely love babies in white and cream, and this color scheme was perfect for the holiday season. This first birthday cake smash is definitely one to remember. Here are a few of my favorite photos from Baby V’s cake smash. Baby V enjoyed her cake and while she was fascinated with my camera, I managed to get a few great smiles from her! We ended the celebration with a warm bubble bath to get all cleaned up! Overall, Baby V’s session was a pleasure to capture from beginning to end, and I’m looking forward to her next milestone. Do you have a little one celebrating a birthday soon? I’d love to talk with you about planning a milestone session. Simply contact me for more information.